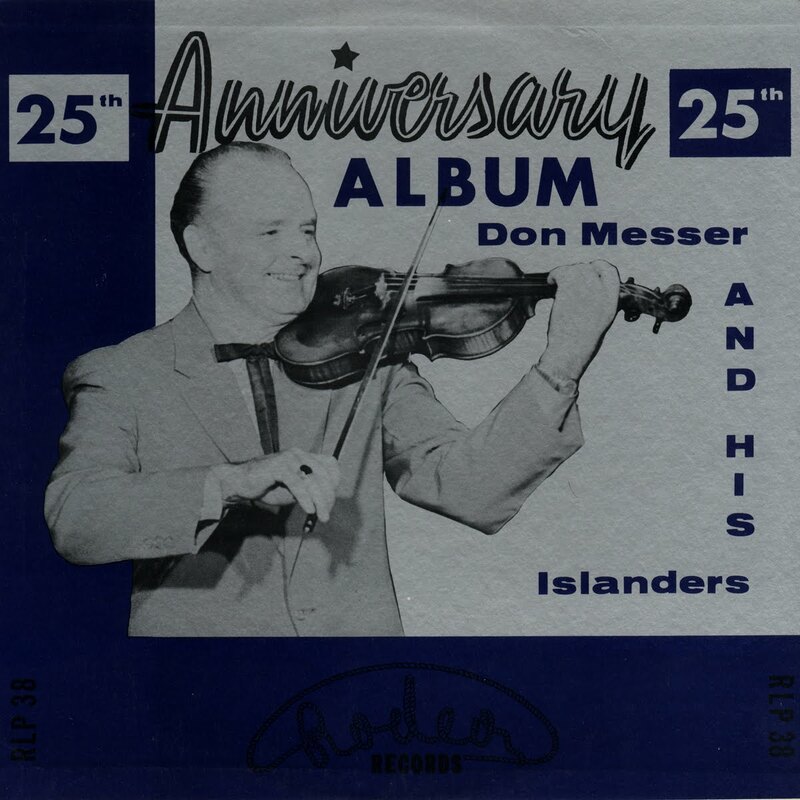 Probably the most widely distributed recordings by Don Messer are the twelve tunes he recorded for Rodeo in 1958. It has never been clear to me why Don, who recorded practically exclusively for the Compo Company's Apex label (later adopted into the MCA line) his entire career made a "25th Anniversary Album" for George Taylor's Rodeo Records. What I do know is that these tracks have been released in every format including 78 (pictured below), LP, 8-track, cassette, and finally to CD from which mp3 rips have circulated the internet. 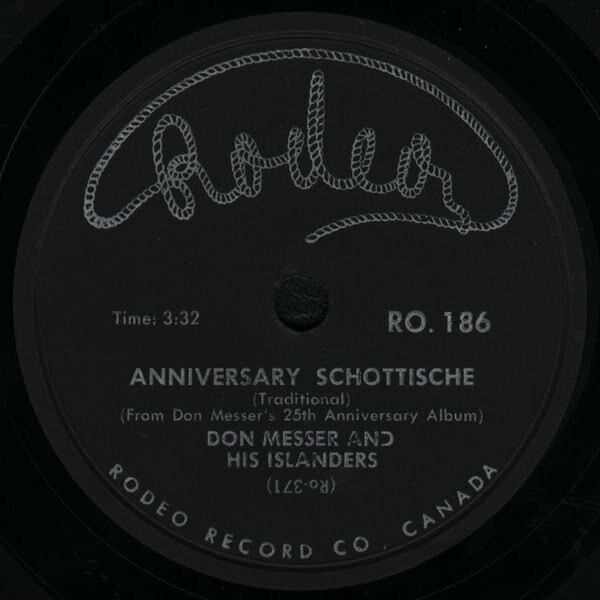 The original LP release was Rodeo RLP 38 but like most Rodeo titles it was later re-issued on the label's Banff line as "Canada's Don Messer and His Islanders" (Banff RBS 1266, c. 1965). Unfortunately a (fake) stereo version of the Banff issue was also offered (Banff SBS 5266) and this edition accounts for most of the circulating copies. Subsequent adaptations of the album to other formats have continued to use the the "stereo" versions, which have also found their way onto many Canadian fiddle compilations. I can usually tolerate fake stereo more than most and put up with a little echo, but in my opinion what was done to these classic recordings is right up there with Capitol's dreadful "duophonic" monstrosities. I am pleased, therefore, to present here what I believe are the first digital versions sourced from the rare original mono LP. Enjoy! 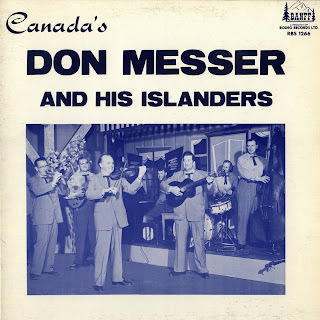 Patronella (Melotone 93106, Starr 16072, Apex 26299-B) - Messer's first records were made in 1937 employing an unconventional process whereby the Compo Company of Montreal arranged permission to record tunes off his CBC network radio broadcasts. 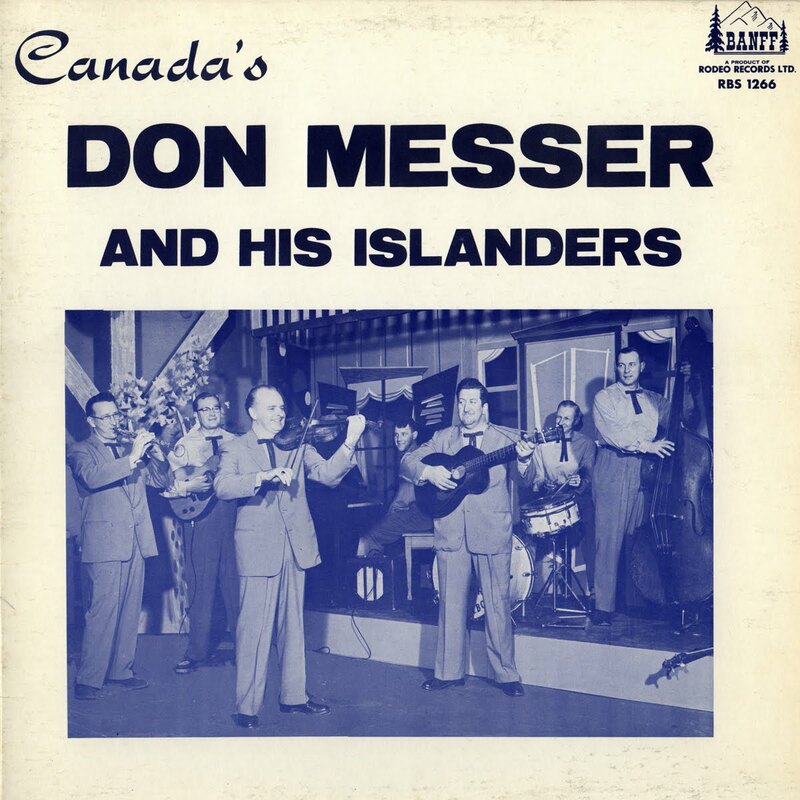 Six titles were recorded this way and first released on the Melotone label as "Don Messer and His New Brunswick Lumberjacks" and on the Starr label (aimed at the French Canadian market) as "Orchestre Don Messer". 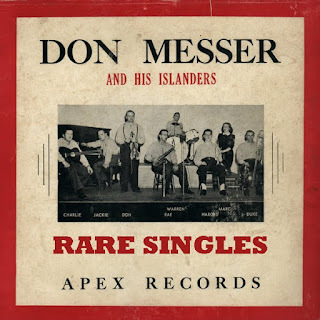 In the 1940s these recordings were integrated into the Apex label's 26000 series with the more familiar "Don Messer and His Islanders" label credit and by 1960 five of the six titles were reissued on LP. "Patronella", recorded July 3, 1937, had to wait until 1979 when a fairly noisy transfer was included on "The Good Old Days", a collection of vintage Messer records and radio transcriptions (click here). The present version is a new transfer from an Apex 78 issue of the original matrix on which an announcer's clipped intro can be heard immediately before the tunes starts. Presumably this is due to the "on the fly" nature of cutting a matrix off live radio. Yesterday's Roses / When Paddy McGinty Plays His Harp (Apex 26295-A/26295-B) - In July of last year I posted a collection of recordings by Charlie Chamberlain including a number of titles from 1940s Apex 78s (click here). Since that time I was lucky enough to add this 78 to my collection, thanks to the Attic's good friend Stephen of Cedar Island. Charlie croons a ballad on side A and hams his way through an Irish novelty on side B.
Cec McEachern's Breakdown (Apex 26318-B) - PEI born Cecil McEachern composed this tune which despite becoming standard Canadian fiddle repertoire was never issued on LP. 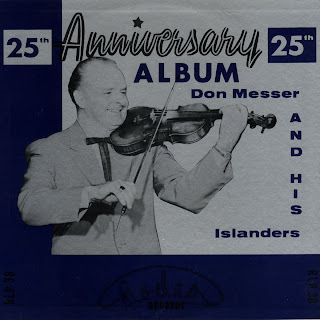 The recording is from 1950, the year before guitarist/fiddler McEachern officially joined the band, but I strongly suspect he is playing second fiddle to Messer on this recording. Cecil is one of the last surviving Islanders alumni, and can be seen here playing in August of last year. 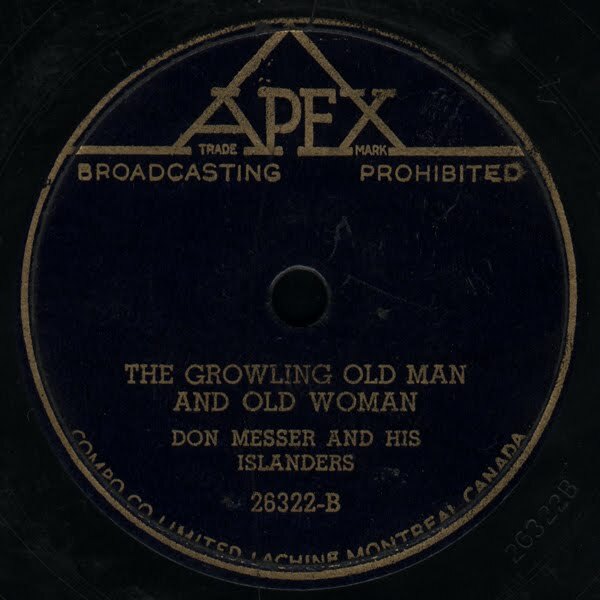 The Growling Old Man And Old Woman (Apex 26322-B) - This great Acadian reel was the flip side of Messer's classic 1950 "Woodchopper's Breakdown" 78. The tune later became a signature of the great Acadian fiddler Gerry Robichaud. 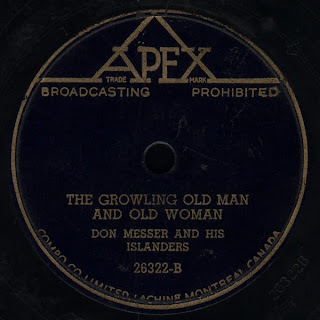 It should not be confused with "The Old Man and The Old Woman" (Apex 26303, 1948), a Quebecois tune which was recorded by Madame Bolduc in 1930 (click here). The Messer recording of the latter tune features Charlie Chamberlain recalling Bolduc's chorus; a live version from "Don Messer's Jubilee" can be viewed here. Gypsy Hornpipe / Harvest Home Hornpipe (Apex 26333-A/26333-B) - Two traditional tunes were issued on this 1952 Apex 78. While "Harvest Home" never made it LP, "Gypsy Hornpipe" was issued on "On The Air", a 1960 promo LP produced for Canada Packers as a customer incentive. The present transfer of "Gypsy Hornpipe" comes from that LP, which can be downloaded here. The Old Red Barn / The Opera Reel (Apex 26340-A/26340-B) - A 1953 release that featured a jig and a reel, both traditional. The electric guitar solo in "The Old Red Barn" is by Cecil McEachern. 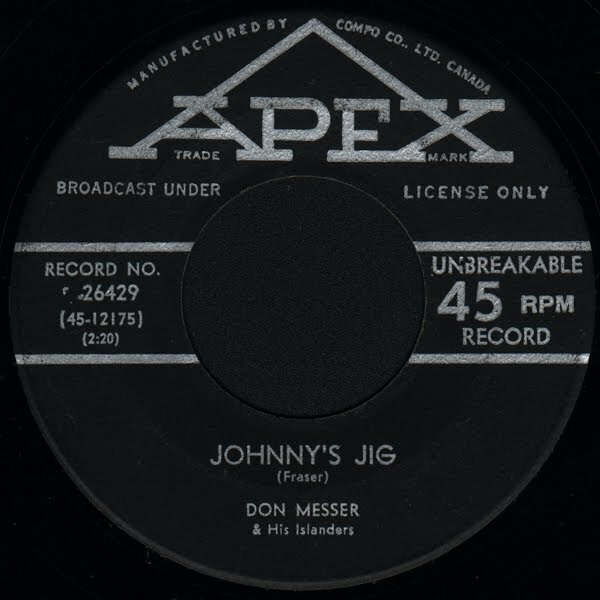 Johnny's Jig (Apex 26429) - This composition of Messer contemporary John Fraser was released on a 1957 45 (b/w "The Skipping Mouse Polka"). Bonnie Prince Charlie / Snowflake Breakdown (Apex 9-26447) - Messer released his last batch of singles in 1960 and thereafter concentrated on the LP market. 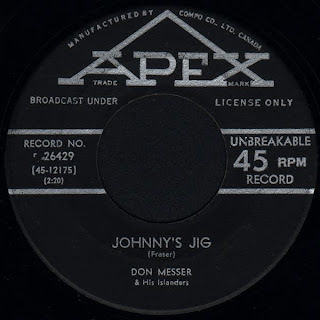 This pairing of two tunes composed by Wally Traugott is from one of these very scarce 45s. The fascinating Wally Traugott was a legendary Canadian fiddler who went on to become a legendary L.A. mastering engineer, having mastered several classic rock LPs. His original late 1950s recording of the now classic "Snowflake Breakdown" can be downloaded here. In addition to these tracks, which have long been out of circulation, I hope to soon present transfers of Don Messer's original LPs which include the bulk of his early titles.